4 Bedroom Detached House For Sale in Marlborough for Guide Price £485,000. 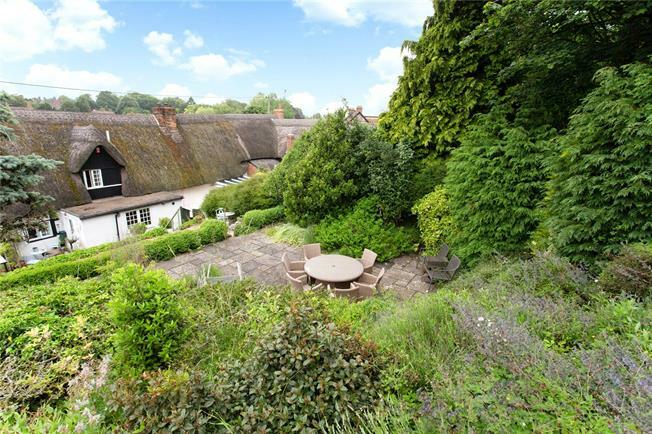 A pretty Grade II Listed thatched cottage with plenty of character and charm believed to date from the 17th century with later additions. The property was formerly two cottages and has been sympathetically and tastefully re-decorated and upgraded beautifully highlighting the many period features including exposed timbers, two large inglenook fireplaces and a former bread oven. The cottage is deceptively spacious, boasting a large open-plan reception room and dining room, a further reception room, two bathrooms, four bedrooms and a landing currently used as a study. The fully fitted modern kitchen and separate utility room are latter additions to the rear of property which have access to the garden. The property is located within a Conservation Area in Collingbourne Ducis, an attractive village to the north east of Salisbury Plain. The village has a shop / Post Office, two public houses, a church, a village hall. Marlborough is about 10 miles to the north and the market town of Hungerford is also within easy reach. Mainline stations Pewsey and Andover are about 9 and 10 miles respectively. To the side of the cottage there is ample parking for 3 cars plus a garage and a carport. The garden is terraced with many areas of interest and steps which provide access through these up the garden. The first terrace makes for an ideal entertaining area with room to enjoy the BBQ, relax and take in the views or walk through the pergola. From here steps lead up to another terrace and the main gardens which are laid to lawn with a variety of trees and shrubs. Within the grounds there is a summerhouse, large shed and apple orchard at the top of the garden which provides wonderful west facing views and a high degree of privacy.